The Fiend Folio is such a wondrous trove of the weird that's hard not to return to it from time to time. Lots of OSR blogs already touched on subject. Well, one of the Fiend Folio's critters is the Frost Man (Frost Folk in D&D 3.5 terms). Called by fearful barbarians of "ice demons", these strange humanoids have the power to freeze enemies with a baleful gaze (one of their eyes is a white orb of ice magic). I can't pleace exactly why, but I always found the Frost Man a damn cool monster - they appear to be some kind of proto-sorcerer, whose pact gave them limited (but potent) magic. ...but I really like the Frostburn art. OK, how this creature became a DCC class in my campaign? Well, my group is currently in the middle of 'DEATH AQUATIC!' - an adventure that I'm playtesting (and that I hope to share with you in the next year Gongfarmer Almanac). At my table I like to bring elements and references from my favorite works of fantasy/science fantasy/horror... and one of them is the world of the awesome Malazan Book of the Fallen. Well, because this an aquatic themed adventure, I created an encounter where the party meets a Stormrider, one of the most alien and fascinanting races of the world of Wu. 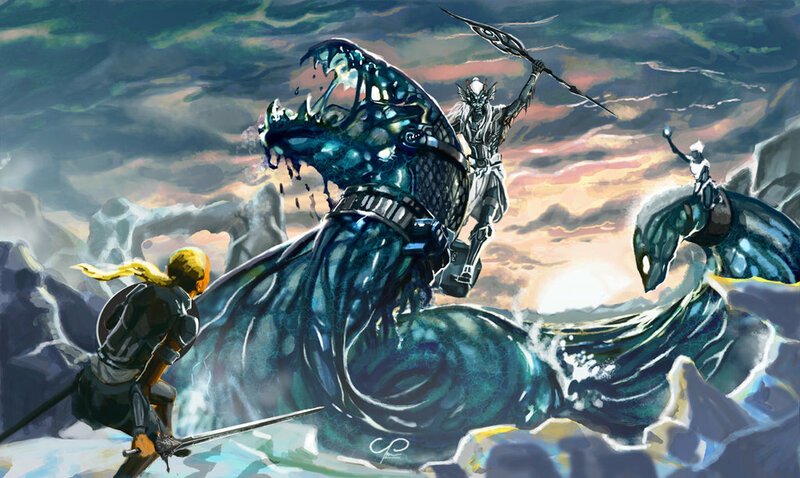 A Stormrider, in this iconic art by Shadaan. For those that don't know them, Stormriders are beautiful and aquatic (but, it seems, amphibious) humanoids, whose magic is aspected with ice and the "void among the stars". Their way of thinking and their goals are often quoted as "alien" (although other sources conjecture that the Riders may be associated with my all-time favorite malazan race - the Jaghut). They are like alien merfolk with fine and iridescent scales all over their body (but they seem to use ice or crystal-like weapons and armors). Riders get their name from their power of shaping waves in the form of giant serpent/horses. In the malazan setting of Wu, Stormriders are responsible for the most dangerous and gruesome battlefiel of the world - the dreaded Seawall of Korel. In my adventure, the party (a mix of 1st and 2nd level PCs, besides 8 funnel characters from 2 new players) was devoured by a gargantuam leviathan. Inside the majestic beast, one of the 0-level PCs foound a magic spear that appeared to be made of ice. This weapon belonged to the Stormrider, who was healing from previous wounds inside a luminescent block of ice. The party eventually freed the Rider, reclamed the ice spear and saves the party from a sea witch and her simian minions. The 0-level PC who freed the Stormrider was really sad for losing the magic spear, so I suggested that the Rider's magic "changed" the lowly mortal. 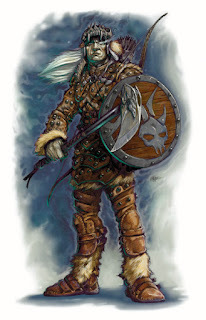 When that PC reached 1st-level I offered to create a new character class, giving him ice-magic. My inspiration came not from the Stormriders, but from the Frost Man above. Whitout further ado, here's the Frost One. A warning: this class is not playtest (in fact, I hope to first test it tomorrow).